I have been in the United States Air Force for over four years and a military spouse for nine years. My husband is in the United States Marine Corps, serving in an infantry unit. Yoga was a part of my life long before I enlisted in the military. My passion for yoga inspired me to teach, and I’ve been doing so for the past seven years. Along the way, I also earned my masters degree in exercise science and health promotion. I have also completed Warriors at Ease Levels 1 and 2, specialized trainings on how to share yoga and meditation safely and effectively with those who’ve been impacted by trauma as a result of combat and/or Military Sexual Trauma (MST). 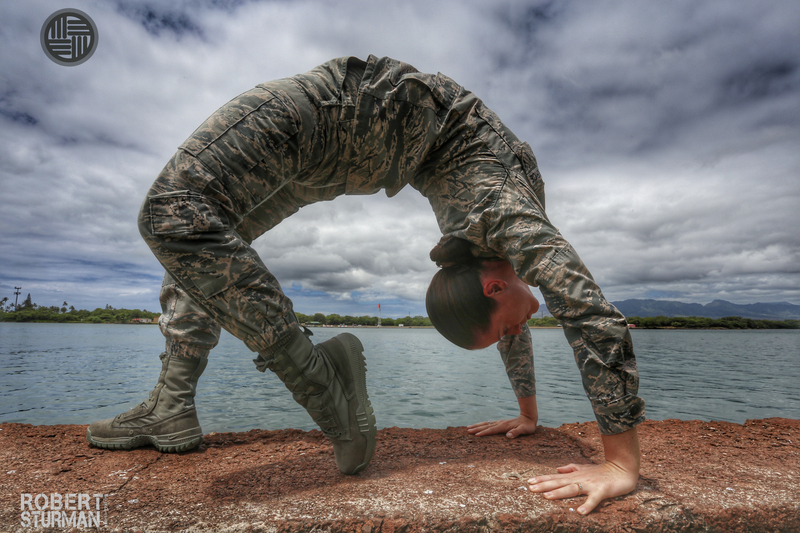 I joined the military because I love my country, but also because I wanted to bring yoga to the military community. I figured the best way to do it was from the inside. I thought service members would be more comfortable coming to a yoga class taught by a fellow service member. Since joining the military, I have been able to teach yoga to my unit as part of our physical fitness training as well as offer yoga classes to veterans in my local community. 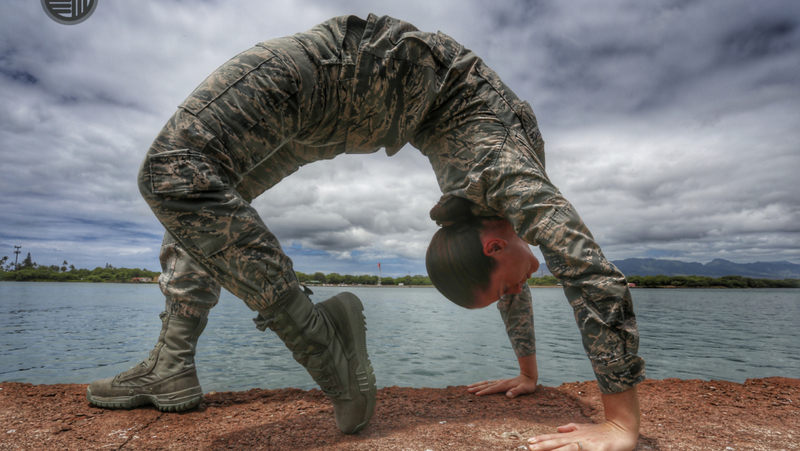 Through my years of practice, extensive training and personal experience in the military, I know that yoga can make a real difference in the lives of service members and veterans. 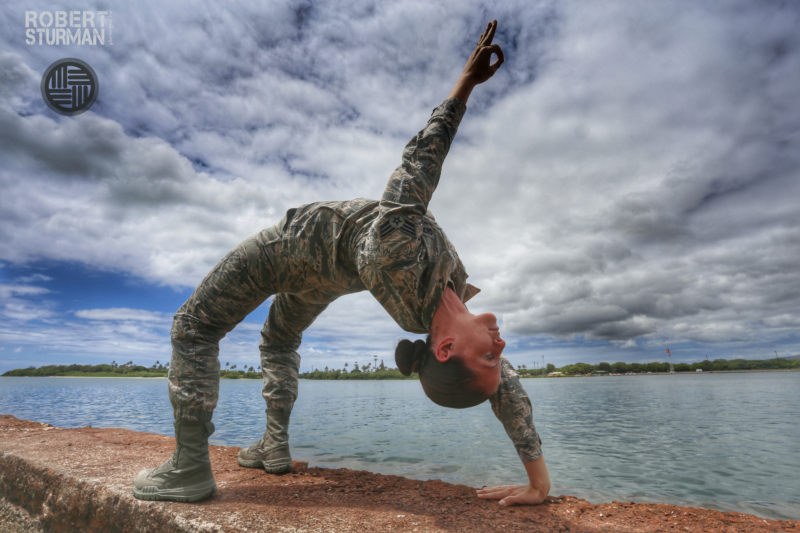 Yoga is also extremely beneficial to military spouses and family members. Being in a dual military marriage, we’ve endured lots of stress, numerous moves and frequent separations. Yoga and meditation have served me well during stressful times as it gives me the opportunity to connect with my breath and come back to the present moment. Without yoga and meditation, I’m honestly not sure how I would cope with all the stress of being a service member and a spouse of a Marine. Yoga is what keeps me sane when my husband is deployed! It also helps me feel “at home” in mind, body, and spirit when I am far away from family and friends. I am proud to be an airman, a military spouse and a certified Warriors at Ease Teacher. I’m thankful for the opportunity to share yoga with other service members, veterans, and military families. The images and use of name, rank, and branch of service does not imply endorsement by any Federal entity. The views expressed are solely those of the individual. 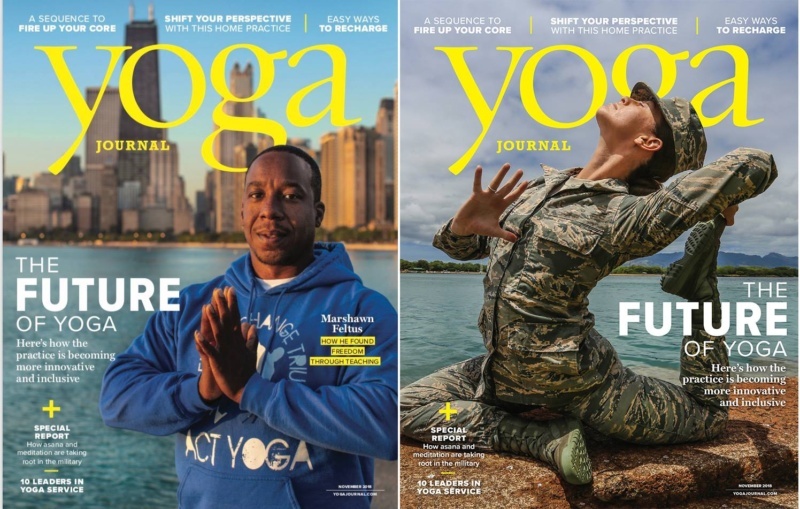 Kristen’s image is part of a double cover issue of Yoga Journal (November/December 2018) that celebrates “The Future of Yoga.” The magazine includes inspiring stories about yoga in the military as well as a special report on how asana and meditation are taking root in the military with great insight from Warriors At Ease Advisory Board member, Lieutenant General (retired) Eric Schoomaker, the 42 Army Surgeon General. Warrior at Ease (WAE) is not endorsed by the Department of Defense or Department of Veterans Affairs.